Dates and times in Excel are represented by real numbers, for example “Jan 1 2013 12:00 PM” is represented by the number 41275.5. The integer part of the number stores the number of days since the epoch and the fractional part stores the percentage of the day. # Widen column A for extra visibility. # A number to convert to a date. # Write it as a number without formatting. To make working with dates and times a little easier the XlsxWriter module provides a write_datetime() method to write dates in standard library datetime format. Specifically it supports datetime objects of type datetime.datetime, datetime.date, datetime.time and datetime.timedelta. See the datetime documentation for other date/time creation methods. # Displays "23 January 2013"
# Expand the first columns so that the dates are visible. # Create a datetime object to use in the examples. 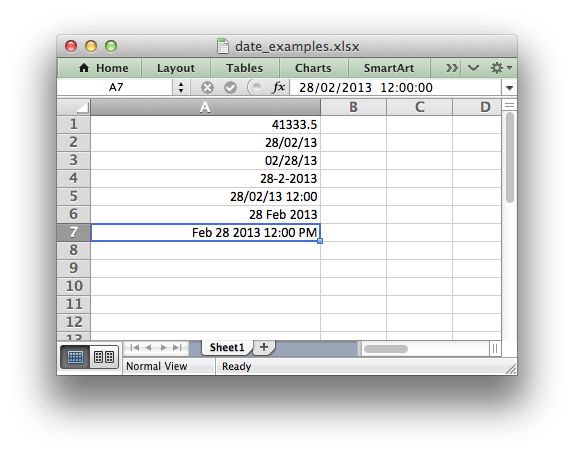 # Examples date and time formats. # Start from first row after headers. # Write the same date and time using each of the above formats. # Create a format for the date or time. 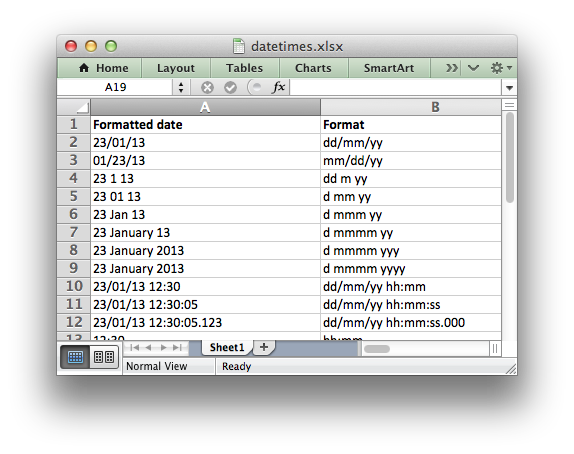 # Write the same date using different formats. # Also write the format string for comparison. In certain circumstances you may wish to apply a default date format when writing datetime objects, for example, when handling a row of data with write_row().